Tell us what activities you’d like to do, what kinds of art projects you’re interested in, and which local artists you’d like to work with. Music! Visual arts! Dance! Video! You tell us what you want, and we’ll try to make it happen. AND we’ll give you pizza! 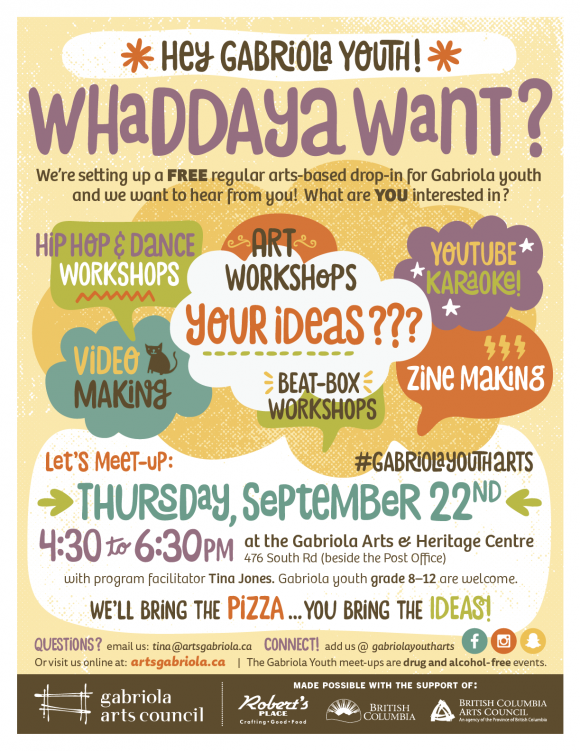 First Gabriola Youth Art Jam is Thursday, September 22 @ 4:30 pm — and then every second Thursday at the same time. Thank you Tina Jones & GAC, this looks fantastic, what a great opportunity for the teens!! !